The red brick of the Arlington Hotel shines brightly in this color photo of downtown Carson. Here on the west side of Carson, between Spear and Robinson, are the hulking Arlington and the smaller Gray Reid Wright Building next door to the left. In that building is the Western Auto Supply Co., Carl L Cathey proprietor. Next door on the ground floor of the Arlington is the Scheri Shop, Lingerie and Novelties. Next to the guy on the ladder working on the awning you can see a barber's pole mounted on the building, and the next storefront down is the Coffee Shop. 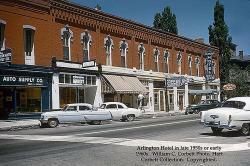 Then at the end of the building is the lobby for the hotel, and the Arlington Bar. 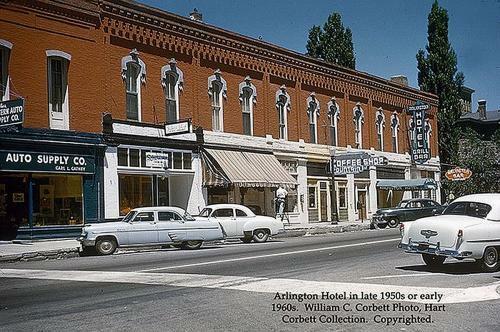 Source Caption: Arlington Hotel in late 1950s or early 1960s. William C. Corbett photo, Hart Corbett Collection. Copyrighted.